A regular permanent resident; the House Sparrow was a common species during the Minnesota Breeding Bird Atlas (MNBBA). Native to Eurasia, the House Sparrow now has a global distribution due to multiple introductions throughout the world. A permanent resident throughout its North American breeding range, the species is now a common species across the southern Canadian provinces and throughout the United States and entire Western Hemisphere. In the United States the highest densities occur in the largely agricultural and/or densely populated states of Iowa, Illinois, Indiana, and Ohio. Extremely high densities are also found in southern Alberta (Figure 1). Introduced to North America in 1852, this non-native species is not a conservation concern; local populations are often managed to reduce competition for nesting cavities with native species. A permanent resident with no migratory movements in North America. A ground forager, House Sparrows feed primarily on grains but will supplement their diet during the breeding season with insects and other arthropods. Anyone who has observed the birds in urban settings knows they will readily consume waste food items as well. Nest sites are quite variable, although the female prefers a site that is enclosed. Common sites include nest boxes, holes in buildings, rain gutters, dense vertical growths of ivy on buildings, and just about any hole in any man-made structure. They resort to constructing nests in trees and shrubs only when the latter options are limited or unavailable. Breeding distribution and relative abundance of the House Sparrow in North America based on the federal Breeding Bird Survey, 2011–2015 (Sauer et al. 2017). Roberts (1932) first observed a flock of House Sparrows in Minneapolis in the fall of 1876 only to discover later that a St. Paul resident had a dozen of the birds brought from New York and released in his garden the previous summer, in June 1875. By 1877, the House Sparrow was established as a breeding bird in the Twin Cities. The species first spread through the state by following the railroads, arriving in Fillmore County in 1886, in Duluth in 1887, along the Iron Range in 1892, and in the Red River valley about the same time. The story of the House Sparrow in Minnesota was repeated in settlements across the United States in the late 19th century. European immigrants, eager to bring familiar elements of their homeland to America, were zealous in their efforts to introduce the House Sparrow to the United States. Some also believed the bird would be a more effective predator of insects that plagued the shade trees of their neighborhoods than native species (Roberts 1932). As mistaken as this notion was, small flocks were introduced in at least 100 cities in 33 different states and Canadian provinces in the latter half of the 19th century, including St. Paul. The first effort was in 1850, when eight pairs were imported from England to the Brooklyn Institute in New York City. Although they did not fare well when released, a second effort in 1852 was successful, and the rest is history. It took only 40 years for the House Sparrow to occupy the United States, considerably faster than the rate of spread by the Starling, which 50 years after its initial introduction still had not reached the West Coast (Bent 1950, 1958). Multiple introductions certainly hastened the sparrow’s journey, but equally important was its dietary dependence on and attraction to grains. Its progression west followed major roads and railways, where waste grain was dropped by vehicles, horses, and railroad cars loaded with grain or cattle. Cities and towns along these lines were often the first sites where small, local breeding populations became established. These then became the source populations for further expansion into the surrounding rural towns and farmsteads (Bent 1958). By 1932, when Roberts published his treatise on Minnesota birds, the House Sparrow was already “an abundant permanent resident, breeding throughout the state.” By 1975, Green and Janssen were able to provide further clarity on its statewide distribution, noting its presence wherever there were towns or farms. It did not occur, however, in the extensively forested landscape of northern Minnesota. A few years later, Janssen (1987) included a distribution map that identified 27 counties where the species had been confirmed nesting since 1970. Hertzel and Janssen (1998) later added an additional 11 counties to the list. MNBBA participants tallied a total of 3,675 House Sparrow detections from 41.0% (1,979/4,831) of the surveyed atlas blocks and from 51.9% (1,212/2,337) of the priority blocks. Breeding evidence was collected in 822 (17.0%) atlas blocks surveyed (Figure 2 and 3; Table 1). House Sparrows were reported from every county except Cook. Breeding was confirmed in all but 3 counties: Cook, Koochiching, and Lake. The species remains uncommon throughout the most extensively forested landscapes of northeastern and far north-central Minnesota. The MNBBA predicted distribution map predicts that the highest breeding densities are associated with the biggest human population centers in southern and western Minnesota (Figure 4). The Twin Cities region, Rochester, and St. Cloud are among the sites of high-predicted House Sparrow densities. Breeding densities are moderate throughout the southern half of Minnesota and north through the Red River valley. Densities are predicted to be extremely low throughout the Laurentian Mixed Forest Province with the exception of the Iron Range in St. Louis and Itasca Counties and the cities and smaller communities that dot the landscape. Breeding distribution of the House Sparrow in Minnesota based on the Breeding Bird Atlas (2009 – 2013). Summary statistics of observations by breeding status category for the House Sparrow in Minnesota based on all blocks (each 5 km x 5 km) surveyed during the Breeding Bird Atlas (2009-2013). Summary statistics for the House Sparrow observations by breeding status category for all blocks and priority blocks (each 5 km x 5 km) surveyed during the Minnesota Breeding Bird Atlas (2009-2013). Predicted breeding distribution (birds detected per 10-minute point count) of the House Sparrow in Minnesota based on habitat, landscape context, and climate data gathered during the Minnesota Breeding Bird Atlas (2009-2013) using the General Linear Modeling method without an adjustment for detectability. The House Sparrow is largely an inhabitant of cities, towns, and farms. It is never found in natural settings, such as forests and grasslands, but can always be found near buildings, ranging from farmsteads in rural areas (Figure 5) to skyscrapers in the middle of a major metropolitan city. Habitat data collected within 200 m of MNBBA point counts where House Sparrows were detected demonstrate the species’ strong association with development (Figure 6). Typical breeding habitat of the House Sparrow (© Lee A. Pfannmuller). Habitat profile for the House Sparrow based on habitats within 200 m of point counts where the species was present during the Minnesota Breeding Bird Atlas (2009-2013). Data gathered by the federal Breeding Bird Survey (BBS) were used to generate a North American population estimate of 82 million birds in 2013; this represents approximately 15% of the estimated global population of 520 million birds. In Minnesota there are an estimated 1.8 million House Sparrows, or 2% of the North American population (Partners in Flight Science Committee 2013). As abundant as House Sparrows may seem to be in the larger cities and towns of Minnesota, populations are significantly higher in other midwestern states. In Minnesota, an average of 84 House Sparrows are detected on BBS routes in the state each year. In Iowa, Illinois, Indiana, and Ohio the average number ranges from 328 in Ohio to 541 in Illinois (Sauer et al. 2017). At the beginning of the 20th century, House Sparrows were considered the most abundant bird in the United States. Its numbers have declined markedly since then (Bent 1958). This decline was particularly noticeable in urban areas in the early 1900s, where the species’ decline was attributed to the decrease in horses as motor vehicles became the favored mode of transportation. Even in rural areas, increased industrialization was considered a factor. Horse manure provided a “bountiful food supply” of waste grain along streets and highways and in farm pastures (Bent 1958). Although these changes occurred decades ago, the House Sparrow population continues to decline. Since 1966, when the BBS began monitoring land birds, the House Sparrow has experienced a significant long-term decline of 3.61% per year (Sauer et al. 2017). In Minnesota the decline has been a little steeper, with a significant annual decline of 4.08% (Figure 7). The decline is evident throughout most of Canada and the United States (Figure 8). Recent declines are believed to be the result of more intensive agricultural practices. Increasing applications of pesticides reduce insect populations, which can lower food availability for nestlings, while more efficient farming practices reduce the availability of waste grain. Both are changes that are bound to impact House Sparrow numbers in agricultural landscapes (Lowther and Cink 2006). 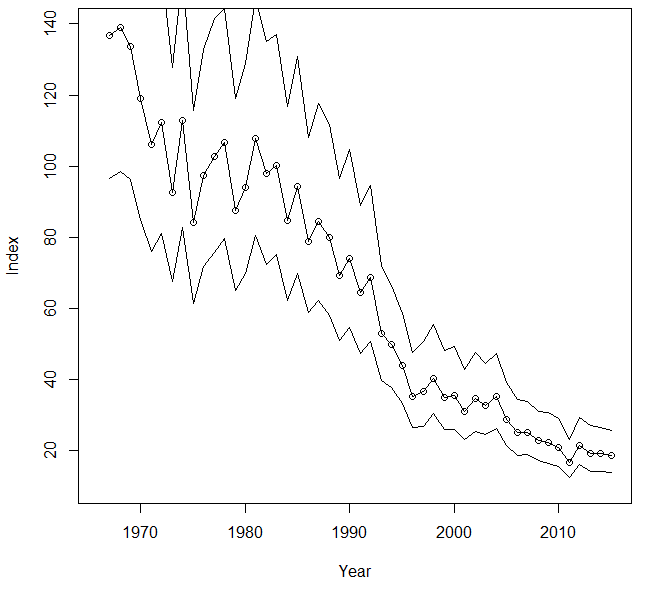 Breeding population trend for the House Sparrow in Minnesota for 1967–2015 based on the federal Breeding Bird Survey (Sauer et al 2017). Breeding population trend map for the House Sparrow in North America for 1966–2015 based on federal Breeding Bird Survey (Sauer et al. 2017). The [House] Sparrow is a noisy, boisterous, and aggressive bully in its relations with other species. . . . It drives bluebirds, swallows, and wrens from their nesting boxes by force, or by preempting them in advance. Some of these rightful tenants of the boxes can resist eviction by an aggressive pair of sparrows, but they cannot withstand mob violence when the sparrows attack in superior numbers, as they sometimes do. The House Sparrow is not protected under the Migratory Bird Treaty Act or by many federal, provincial, and state regulations (Lowther and Cink 2006). Warming temperatures, considered a threat to many North American birds, are unlikely to pose any problems for the House Sparrow (North American Bird Conservation Initiative 2010). Despite its decline, this adaptable species, which thrives in developed landscapes, is likely to remain a common breeding bird in Minnesota for many years.